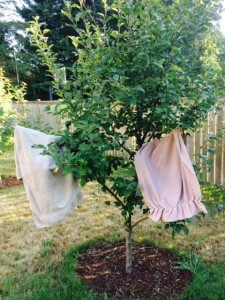 As the Summer days seem to become warmer and my kids head to the pool at our cabin or our local pool we tend to have plenty of wet towels in need of drying. My kids can tend to pile them up on the laundry room floor, yet there is not need to wash them after every swimming adventure which is why I once again am excited that Merry Maids, the expert in home cleaning, is continuing to empower us moms to enjoy a summer of “Mom-Cation” moments – the moments when moms get a little help tackling the notorious summer messes and the kids take some of the clean-up duty off moms’ shoulders. Today I’ll share Tip #5 with you on how to send the towel piles. Warmer weather means kids are spending more time in the water – whether it’s jumping into a neighborhood pool, splashing friends with the garden hose, or running around on a slip ‘n’ slide. However, water activities lead to wet swim suits and soggy towels that can leave marks and water stains throughout the house. Once the kids are done playing in the water, Johnson recommends parents entertain the kids outside for five to ten minutes before heading back into the house, allowing enough time for swim suits to dry. · Make It a “Mom-Cation” Moment: To make it easier for the kids to help prevent any slippery messes, Johnson recommends setting up a towel tree by the pool or placing a laundry line in the bathroom on which kids can hang their swimsuits and towels to dry completely. Now it’s your turn share you r “Mom-Cation”Moments and WIN. Merry Maids is offering prizes to moms who share photos and stories of “Mom-Cation” moments on the Merry Maids Facebook page using the hashtag #momcation,. Disclaimer: I have teamed up with Merry Maids in support of this campaign. We received compensation for participation in this campaign. However, all thoughts and opinions are my own.